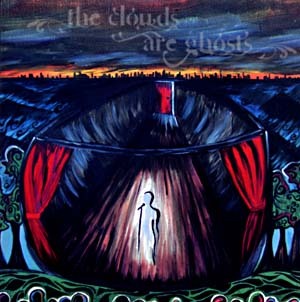 Local Austin band The Clouds are Ghosts, composed of four members from Beaumont, TX and Savannah, GA, formed in 2008 and released their first album, The Clouds are Ghosts, late last year. Ever since then, they’ve been making the rounds in Austin’s music venues to drum up support for their album. I recently had the opportunity to listen to their debut, and among the many Austin bands I have heard, The Clouds are Ghosts have a certain sound, drive, and professionalism that differentiates them from the pack. Based on this album, they’re definitely one of the local bands to watch. The Clouds are Ghosts does not fit neatly into any one genre, but instead pulls elements from many different musical styles and combines them to dramatic effect. The band’s particular brand of drama at times recalls Bjork, Radiohead, and Blonde Redhead, with a shot of Queen tossed in for good measure. As a result, there’s a lot to unpack here – pieces of industrial electronica, space rock, evocative electro-acoustic instrumentation, emo synths, and passionate vocals. The prevailing theme on the record is mysteriously dark emotion with a melodramatic flair. Despite how heavy all of that sounds, it’s an intensely satisfying listen, one that will have you clicking play more than once to catch all the different components. In fact, listening to the album and hearing those different components gives the distinct impression that this band’s aspirations exist in an entirely different plane altogether. They’re futuristic, but somehow nostalgic. They’re emotionally wrenched, but still uplifting. The album is conceptually scenic, but individual tracks are still covertly engulfing. The violin and (really quite beautiful) piano work create warmth, while the synths take it away. It’s a real feat to keep a distance as well as to compel, but The Clouds are Ghosts pull it off in spades. There is so much quality musicianship on this album, and Jason Morris is an extremely versatile and talented vocalist. While some tracks do stand out more than others, my recommendation is to listen to the album as a whole for full effect. The Clouds are Ghosts clocks in at under 34 minutes and it’s time well worth spending. The Clouds are Ghosts are giving the album away for free on their website. Download it, check it out, and let me know your opinions.